The poets of the Great War were often adept at articulating not only the horror of battle, but also the suffering experienced by those who served. While “Suicide in the Trenches”, published in 1918, describes that suffering in wartime, that anguish continued for many long after the guns fell silent. With Mental Health Week just behind us and Veterans Health Week ahead, it is fitting to turn to a consideration of Veteran Mental Health that matters as much to veteran wellbeing in the century after World War One, as it did for Sassoon during the conflict. 1931 proved a devastating year for the military community in terms of suicide. In March at Malvern in Victoria, Major General Harold Edward “Pompey” Elliott CB CMG DSO DCM VD died at the age of 52, the verdict ruling suicide. 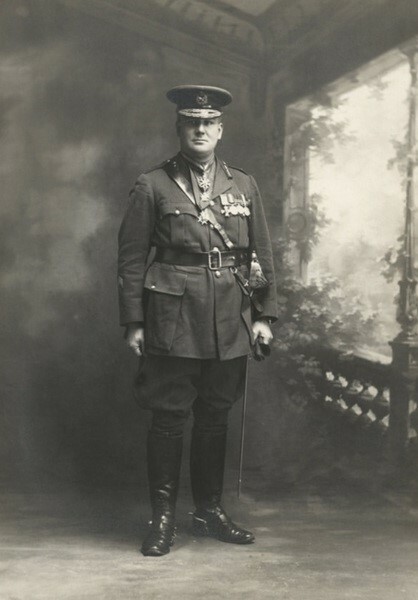 Elliott was awarded a DCM for his service in South Africa during the Third Anglo-Boer War. On his return, he studied law and established a firm of solicitors before returning to the fray as commander of the 7th Battalion in 1914. He was wounded at Gallipoli and four of the seven Victoria Crosses awarded for the Lone Pine offensive went to his unit. 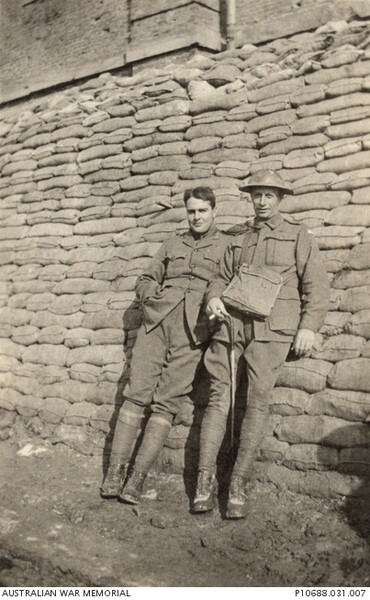 On the Western Front, the Battles of Fromelles, Bullecourt, the Third Ypres, the German Spring Offensive and Mont St Quentin all came and went with Elliot and his men playing a significant part. His service during and after the war was also characterised by heated disagreements with Birdwood, White and British High Command, most often when he saw the safety of his men being compromised, and bitter disappointment over the delay of his promotion to major general until 1927. The Funeral Cortege of Captain D.A. Twining, proceeding from Keswick Barracks in the background, to the AIF Cemetery on West Terrace. The procession was lead by Brig Raymond Leane, Army Museum of SA. August of the same year saw another funeral with full military honours, this time in South Australia. 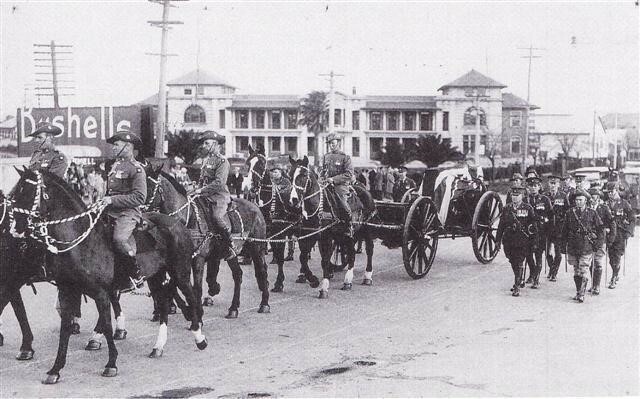 This time the army horses were put into service to convey the coffin of Captain David Austral Twining MC MM MiD CdG to the AIF section of Adelaide’s West Terrace Cemetery. The boy from Ballarat, who had called Kalgoorlie home had served with the 16th Infantry Battalion at Gallipoli in November of 1915. Eight months later he was with the 48th Infantry Battalion at Pozières and with them the following year at Passchendaele. His service in the Great War saw Twining awarded a Military Cross, Military Medal and the French Croix de Guerre. Peace time saw him return to the army, after a brief stint in civilian employment, graduating from the Royal Military College Duntroon joining first the 6th Battalion (Melbourne City Regiment) and later transferring to South Australia as Staff Captain of the 3rd Infantry Brigade.3 The welfare of his men remained of paramount importance to Twining in peacetime, with the News reporting that he took a "great interest in the welfare of citizen force officers and non-commissioned officers." His "cheery disposition" ensured that he was well liked.4 Captain Twining was found dead in his office at Keswick Barracks, he was 36 years old. The long history of the adverse effect of conflict on mental health has arguably been accompanied by an equally long history of the stigma surrounding mental illness. If the Mental Health Week programming on ABC each year would have the viewers take away anything, it would be to move beyond the stigma and stereotypes and towards greater understanding. For the significant proportion of the Australian population, including the 11,016 ADF personnel who experienced a mental disorder in the 12 months preceding the study, stigma plays a major role in the unwillingness to seek help. Harm to career, the prospect of being treated differently or seen as weak were the most significant across commissioned and non-commissioned officers and other ranks. These factors are not exclusive to modern combatants. For Sassoon in 1918, the greatest crime of the cheering crowds was the ignorance of suffering that had no outward manifestation. Even worse is the pretence of ignorance stemming from stigma, stereotype, and misunderstanding. There has recently been more focus than ever before on the mental health of veteran and serving communities. It is a trend that needs to continue if our service and ex-service populations are to receive the support they need and deserve. 2. A. J. Hill, 'Elliott, Harold Edward (Pompey) (1878–1931)', Australian Dictionary of Biography, National Centre of Biography, Australian National University, http://adb.anu.edu.au/biography/elliott-harold-edward-pompey-6104/text10459, published first in hardcopy 1981, accessed online 19 October 2016. 4. "Popular Staff Officer," News (Adelaide). 13 September 2016 "The POW Death Ships - Australia's Worst Maritime Disasters"